World Cup 2014: Who is on the England plane to Brazil? Ashley Cole will not be involved but plenty of questions remain. Who partners Steven Gerrard in midfield? Is Adam Lallana the surprise package? Will Raheem Sterling continue to shine? Which back-up goalkeepers get the nod? England manager Roy Hodgson will name his squad for the World Cup in Brazil on Monday, with 23 players expected to be announced as definite inclusions and seven others on standby. The final 23 names have to be submitted to Fifa by 2 June, 10 days prior to the tournament starting and 12 days before England face Italy in their Group D opener in Manaus. Since Hodgson took over as manager two years ago, 57 different players have been involved on 25 match days. Their final international audition took place in March, England beating Denmark 1-0. Hodgson's Euro 2012 squad included three goalkeepers, seven defenders, nine midfielders and four strikers. What will he do this time? And who will board the flight to South America? Despite losing his place in the Manchester City team for a spell earlier this season, Hart has been England's undisputed number one for almost four years. His 39 caps have brought 20 clean sheets and he has played in all but three of Hodgson's 25 games in charge. With that in mind, some questioned the wisdom of giving Hart 90 minutes against Denmark and, although he made a fine save from Morten Rasmussen at 0-0, might it not have been more beneficial to bring Forster and/or Ruddy and/or Foster off the bench? Forster has now featured in 12 match-day squads but made only one start. For Ruddy it is 14 match-day squads and one substitute appearance, while Foster has not started for England since 2010. That lack of international exposure could prove costly if Hart gets injured. At just shy of 21, Butland is spending a third loan stint away from Stoke City and looks to be one for the future. At centre-half, Phil Jagielka and Gary Cahill look to be Hodgson's preferred partnership. Jagielka's recent hamstring injury also opened the door for another defender in the Everton backline - John Stones. In deputising for Jagielka and more recently Sylvain Distin, Stones' performances have caught the eye of many, including former England captain Gary Lineker. Phil Jones is likely to get the nod after Ryan Giggs said he "will be OK for the World Cup" after a recent shoulder injury. He should be joined by his fellow Manchester United team mate Chris Smalling on the plane. With Kyle Walker, a certainty for the squad if fit, still unable to train since suffering a pelvic injury on 13 March, Glen Johnson looks odds-on to be the first choice right-back and add to his 50 international caps. Walker's possible absence leaves an opening for right-backs Jon Flanagan of Liverpool and Nathaniel Clyne of Southampton - both of whom are yet to make their England debuts - while Cole's omission means Leighton Baines and Luke Shaw will compete at left-back. As captain and orchestrator-in-chief, Gerrard is perhaps the only cast-iron selection in this fiercely competitive area of the team. The other central midfield position(s) are set to be contested by Gerrard's Liverpool team mate Jordan Henderson and Jack Wilshere after it emerged Michael Carrick would not make the squad. Hodgson will need to be satisfied the latter's injury absence since March does not present a fitness gamble. Wilshere suffered a fracture in his left foot on England duty against Denmark nine weeks ago, but he came on as a substitute for Arsenal in their final Premier League game against Norwich on Sunday. Henderson has played a key role in Liverpool's title challenge this season and has gone a long way to finally justifying his £20m price tag. His form and understanding at club level with Gerrard perhaps puts him above Wilshere in the pecking order. Oxlade-Chamberlain's progress was checked in August by a knee injury that ruled him out for several months, but he has since returned to full sharpness and memories of his superb equaliser against Brazil in the Maracana will not fade in a hurry. "I would try to find a place in the team for him. He gets space, he makes space, he can see a pass, he can go inside and outside of players and he can score a goal himself. "He has energy, he can see a pass and he is ideal for international football." In the attacking positions, the feeling that both Raheem Sterling and Adam Lallana are both almost certainties for Brazil exemplify the seasons they have had. At the BBC's recent World Cup launch, Gary Lineker supported their inclusions, referring to Sterling as a "sensational footballer" and Lallana as a "delightful footballer". Both players have hit a purple patch and been integral to their respective clubs this season - and the question now might not be whether they go to the World Cup but whether they warrant a starting place. Likewise, Everton's Ross Barkley has also played himself into Hodgson's World Cup plans with some fantastic displays this season - not least with the magnificent, 25-yard curling effort he scored against Manchester City recently. Lineker is also a fan of the 20-year-old, calling him "a star in the making" and a "prodigious talent" back in December, 2013. There is greater concern surrounding Hodgson regulars Cleverley, Lampard and Milner - the latter two being used in rotational roles this season and Cleverley the subject of an online petition for him to be banned from being picked for the World Cup squad. 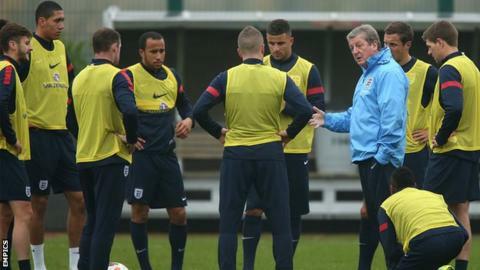 Hodgson has already warned England's "big-name" players that at least one of them faces missing out on the World Cup. This is not an area in which England are particularly well stocked, although the likes of Sterling and Lallana do tend to operate as wide forwards when England attack. Rooney and Sturridge are Hodgson's most obvious sources of firepower and there will be huge pressure on them to lead the line for their country as they do their clubs. Manchester United interim manager Ryan Giggs recently said Rooney is ready to make a big impact at this summer's World Cup. "Wayne is a top player," said Giggs. "He is at a good age. He is probably at the peak of his powers and I know for a fact he can't wait for it." United team-mate Danny Welbeck is also primed for a place on the plane after performing well under Hodgson numerous times in an England shirt. The final place in the squad will likely be contested by Rickie Lambert, Jermain Defoe and Andy Carroll. The 32-year-old Lambert has had another consistent season for Southampton, netting 12 league goals while Andy Carroll has returned strongly for West Ham since injury. If Hodgson needs a reminder of what the 6ft 3in frontman can do, he only needs to recall England's dramatic victory over Sweden at Euro 2012. Defoe has featured in all but two of Hodgson's match-day squads but a move to Toronto FC in the MLS could undermine his chances - despite him scoring at almost a goal-per-game ratio for his new club. A potential wildcard could be Sunderland striker Connor Wickham who scored five times to help his team avoid relegation, picking up the Premier League's Player of the Month award for April in the process. With Hodgson saying he's known his squad for a while however, it might just have come too late for the 21-year-old. King-sized warning: Can England afford to gamble?